Ben was assigned a new wildlife technician and she was driving him crazy. She was blonde and pretty and insisted on carrying beauty products in a little field bag - nail polish, hair care products, gels, creams and so on. One day they were driving the rugged four-wheel drive down a dirt road when a big rabbit ran in front of them and was hit by the truck. Ben pulls over and walks back to the dead rabbit. He felt terrible, but there was clearly nothing he could do for the dead creature. His blonde partner pipes in and yells, "Waite, I have just the thing!" She races back to the truck and begins to rifle through her beauty products. Ben watches as brushes and combs fly from the bag. Finally she races back with an aerosol can and sprays the dead rabbit with it's contents. Immediately the rabbit springs to its feet, waves goodbye, hops a few feet, pauses and waves again. 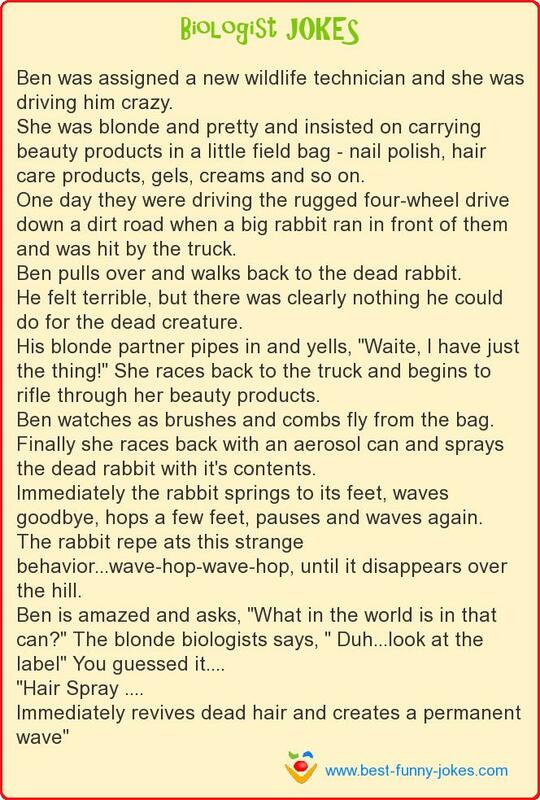 The rabbit repe ats this strange behavior...wave-hop-wave-hop, until it disappears over the hill. Immediately revives dead hair and creates a permanent wave"